Business Class / News / Welcome to Guillaume Piché, Our New Programming Intern! We are pleased to have welcomed Guillaume Piché among our programming interns. 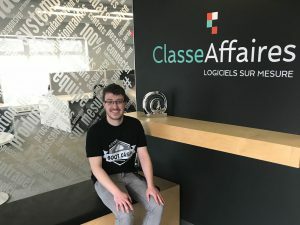 Currently studying Computer Science at Cegep de Sainte-Foy in Quebec, with a specialization in Web, Mobile and Cybersecurity Programming. He will have the opportunity to put his talents to the test thanks to various projects. Guillaume will also brighten our team dinners since he was a cook at St-Hubert for 3 years! When I asked him to describe himself, he mentioned his love for doing things well, his desire to invest himself and his great communication skills. Have a great internship with us Guillaume, and who knows, why not start your career here. Welcome to Classe Affaires!